So, our little league 1 adventure has come to an end. The last game of the season was a weird day. 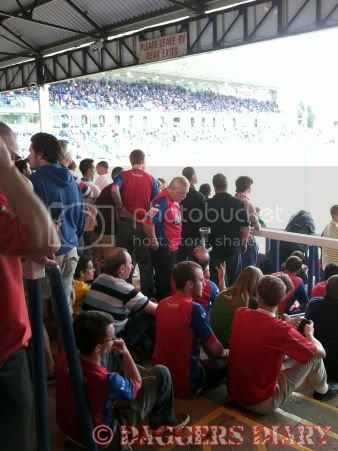 1005 roaring Daggers packed into the away end at Peterborough for a game that would decide our future. We rocked the terrace and made as much noise as ever, more so! We came so close. so, so close. But the writing was on the wall as goal number 2 found the net. For the last dying minutes of the game we threw everything at them but as the final whistle blew we we're on the wrong end of 5-0. Anyone that was there knows it wasn't a proper 5-0 loss, it was a battle. When goal three went in, the posh fans cheered for what seemed like 3 seconds. But we were still cheering on the boys. It was like the whole away crowd accepted relegation in a split second and this wasn’t the time to dwell on it, right now we had to show our lads on the pitch, show our management at pitch side and show the Posh fans, show EVERYONE "this is our team, and we are proud to be Daggers!". The next two goals rolled in with not much more than a whimper from the Posh end, all the while a one thousand strong Daggers army put on a collective brave face and sang. As the players came over to clap us I found myself really sympathising with them, I believe everyone tried their best this season and really believed we could stay up. I hope they can feel proud of the season, I can say I am. As we filed out to the 10 waiting coaches it truly started to sink in, tears started to flow and sympathetic looks and noises were exchanged. We all knew how each other felt; I can say I have felt better. After many hugs, handshakes, goodbyes and "see you next season"'s me and my little troupe climbed into our coach, ready to be taken home. News filtered through that Barnet had saved themselves from relegation down to League 2 "Well" I thought to myself I look forward to losing at Underhill on a wet Tuesday"
It's easy to look over things that happened this season, results that didn’t go our way or ever thrown away and point them out as reasons we didn’t stay up. Believe me, as we had our post relegation drink down at the bell many were touted; that penalty at Orient, that fluff against MK, that 2-0 lead we let slip against Tranmere, losing Benno. All good points but all moot ones now. 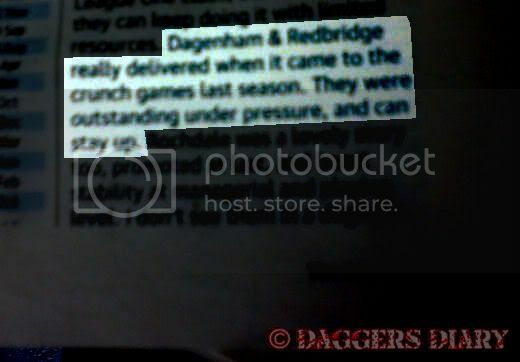 At the beginning of the season I only found one publication that said we could stay up; The Guardians new season guide which said "Dagenham & Redbridge really delivered when it came to the crunch games last season. THey were outstanding under pressure, and can stay up." but everywhere else we we're dead certain to finish bottom, not only bottom but with the lowest ever points total! To go down on the last day by one point, while it may not feel like it, is an achievement. And I think deep down everyone knew it. We now know who our friendlies are against, we have started to see who will be leaving us and the excitement can start to build again. The fixtures for the 11/12 season will be released on the 17th of June and on the 16th we get to find out who we're going to lose to in the first round of the Carling Cup (it be cursed I tell ye!!). We'll get to see our new shirt and then buy it. Most importantly though, a new season means another bash at winning the Essex Senior Cup! You know you care about it, don’t lie! As for us here at Lazy Bastards Corp. Yes we admit we let things slip at the end of the season, but some personal/family stuff came up on both sides and that combined with our hectic (to say the least) end of season schedule left us with a bit of a backlog. But don’t think we have just been ignoring this page, OHHHHHHH NO! We have some plans! Next up will be the 10/11 end of season Awards (not to be confused with the "End of year awards"). So join me, let's look forward to the new season with renewed vigour. 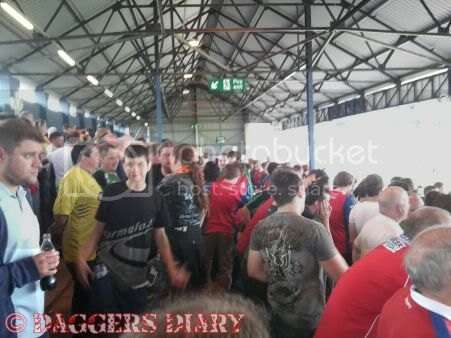 Next - The Daggers Diary 10/11 End of Season Awards!